To begin with, we need to decide on thenumber of loops. They should be enough for the width of the phone and two need to make extra. We will need them as allowances for stitching. The width of our drawing is nineteen loops, and the height is nineteen rows. 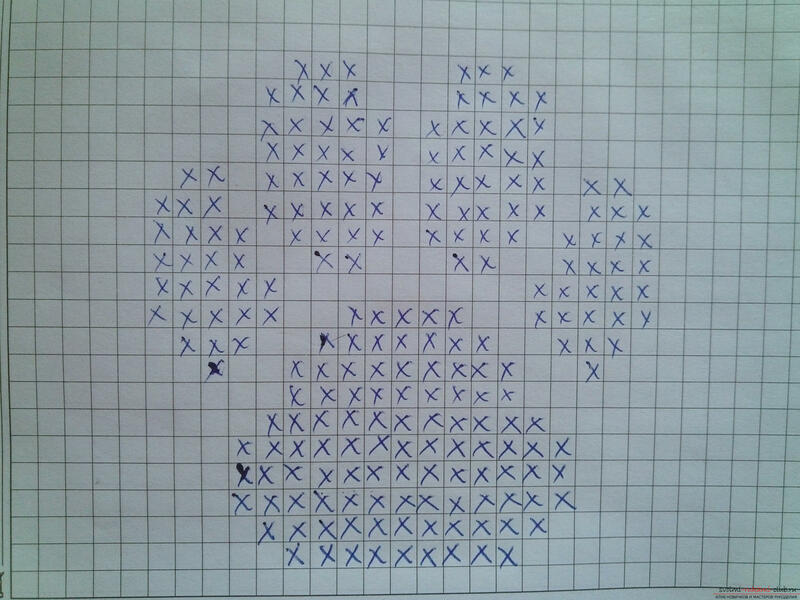 On both sides of the picture, we must keep the same number of loops, so that the drawing is in the middle. We dial the required number of loops. In this case it's twenty-five, which is about seven and a half centimeters. 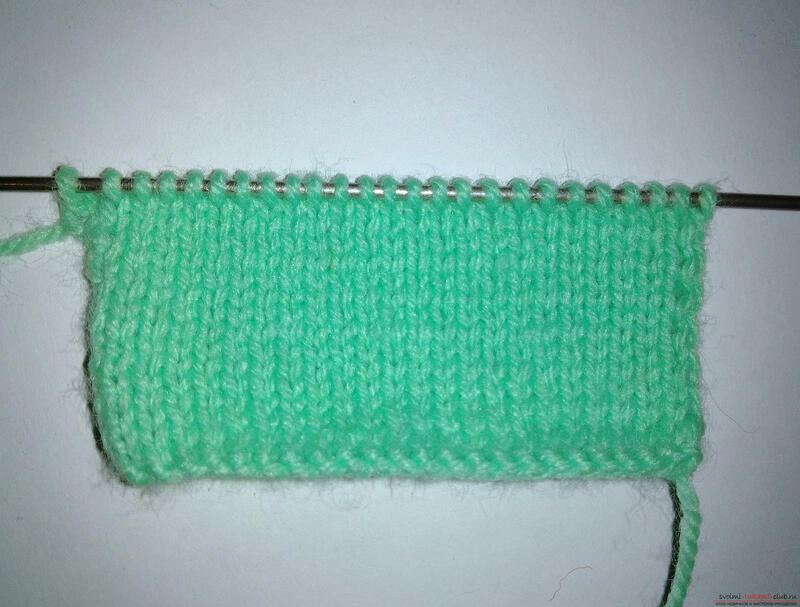 And we knit the usual garter stitch. That is, a series of facial loops, a series of purl and so on. We knit, trying on the phone. In total, you need to tie up so many rows that the canvas covers the second side of the phone by about one third. And only now we turn to the drawing in the jacquard technique. According to the scheme, the first row of the figure is nine loops. That is, we subtract nine from the number of all the loops and divide this number by two. In this case, these are eight loops. 1 row of drawing: We send eight loops of green yarn. Next nine loops of black yarn. 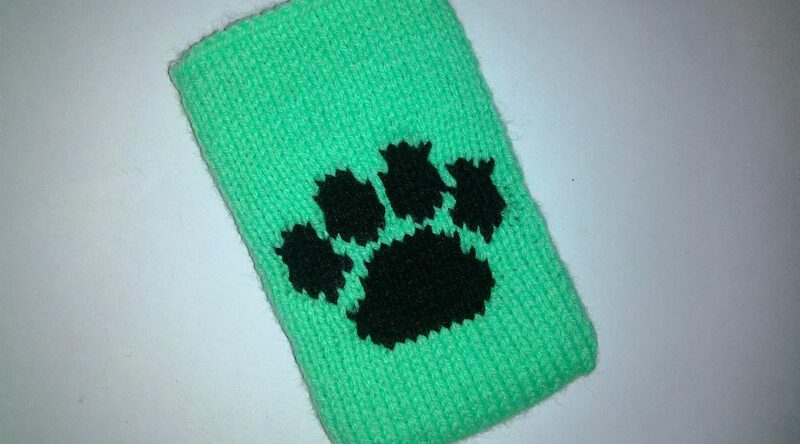 And again eight loops of green yarn. 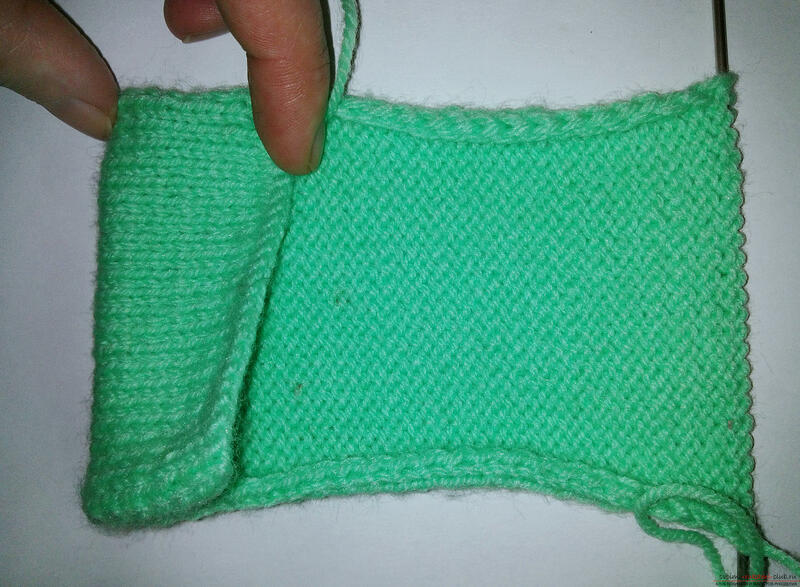 2 picture series: We knit a green one on one loop. Seven green loops, eleven black and seven green. 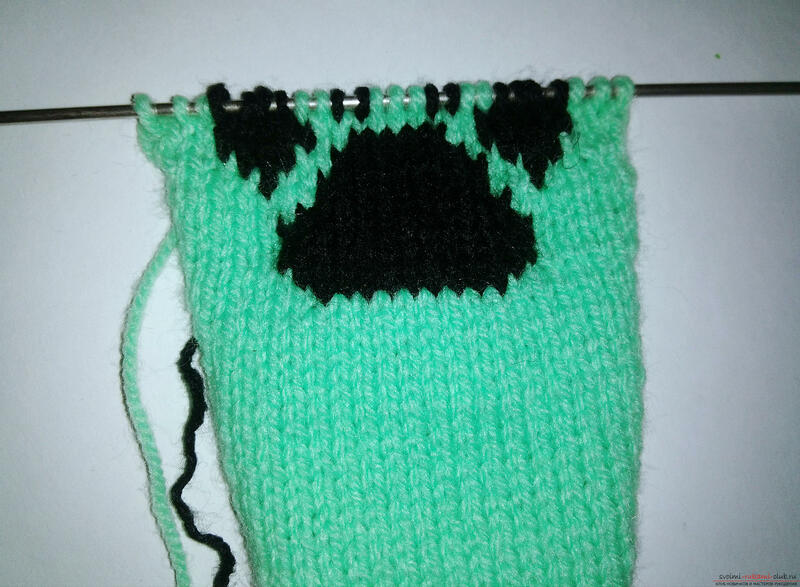 3 row of the figure: There is one more green one for the loop. 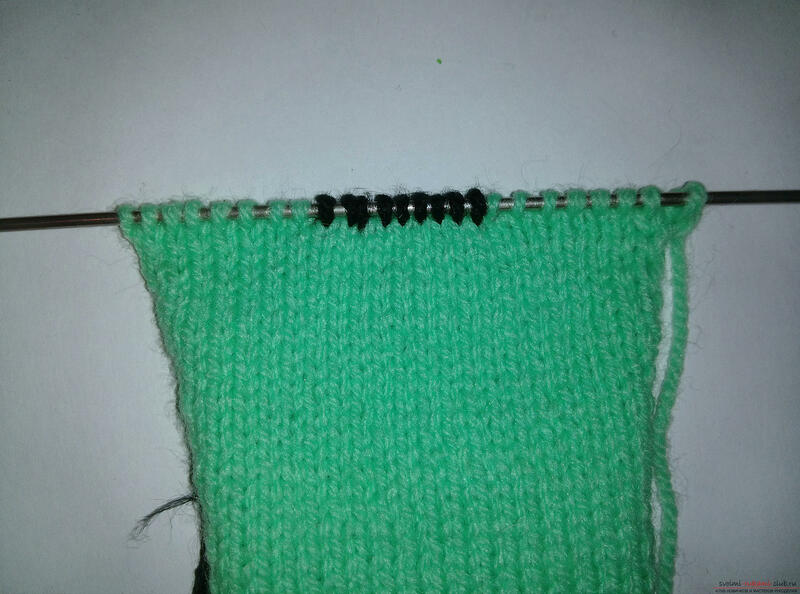 We knit six green loops, thirteen black and six green. 4 and 5 rows of the figure: We knit the same way as the third. 6 series of figures: We knit seven green loops, eleven black and seven green. That is, we reduce the figure. 7 row of picture: We knit eight green loops, nine black, eight green. 8 Drawing series: Now start knitting your fingers. 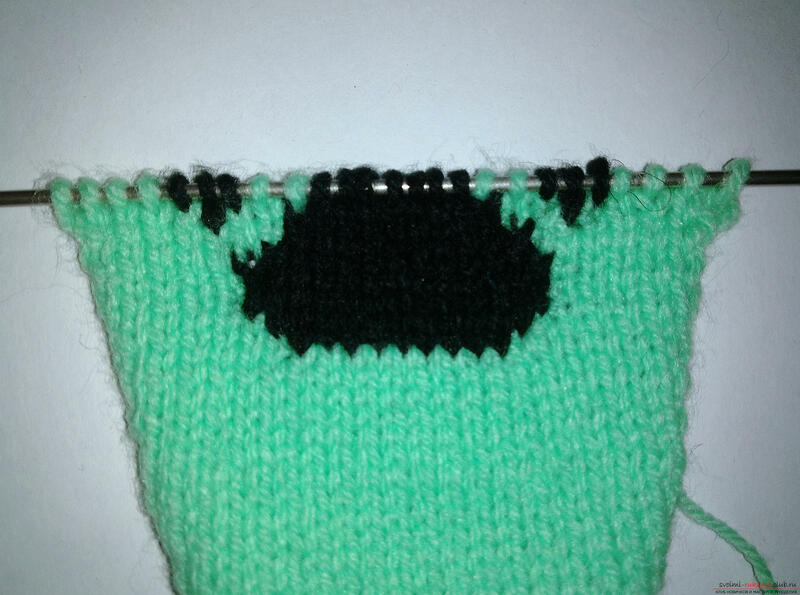 We knit five green loops, one black, two green, nine black, two green, one black and five green. 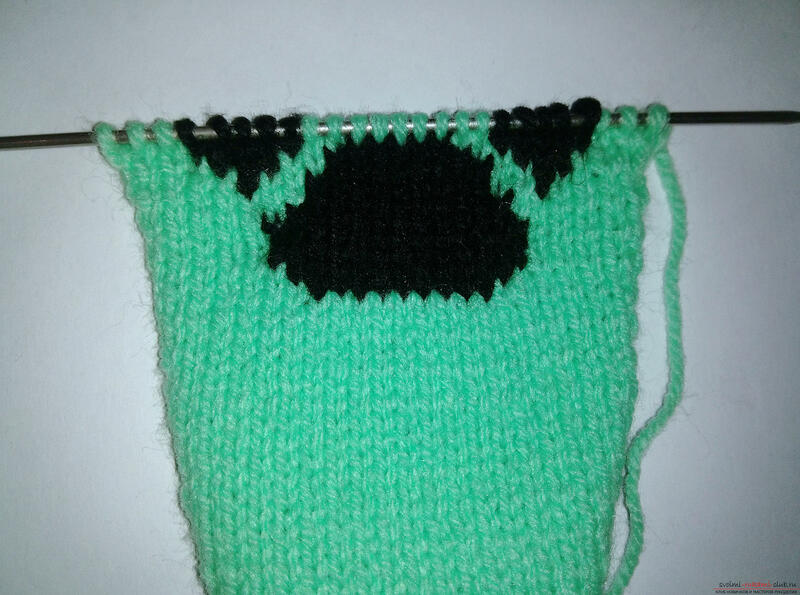 9 series of figures: We knit four green loops, three black, two green, seven black, two green, three black, four green. 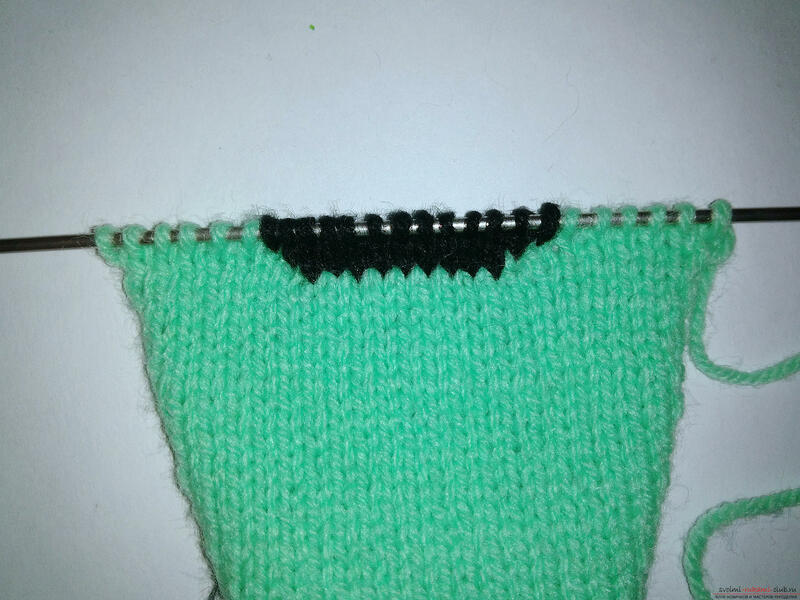 10 picture series: We knit three green loops, five black, two green, five black, two green, five black and three green. 11 series of figures: We knit three green loops, five black, nine green, five black, three green. 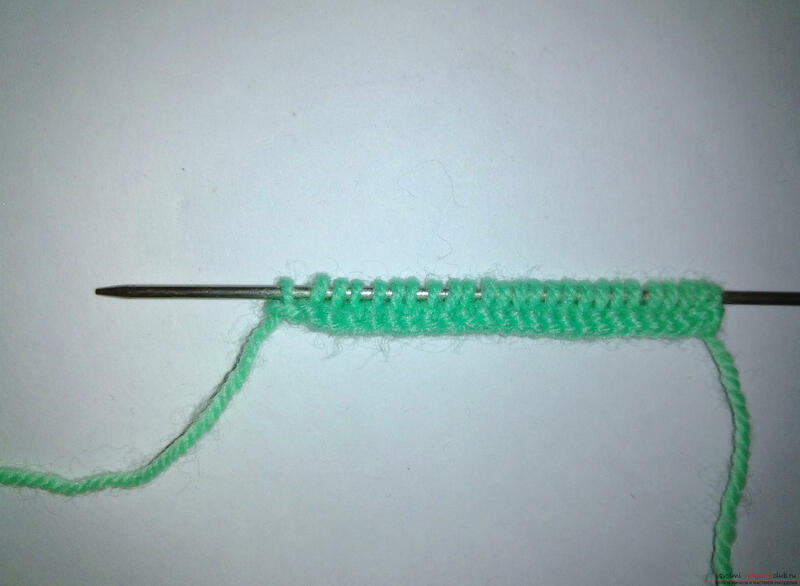 12 row of drawing: In this row we begin to knit two more fingers. 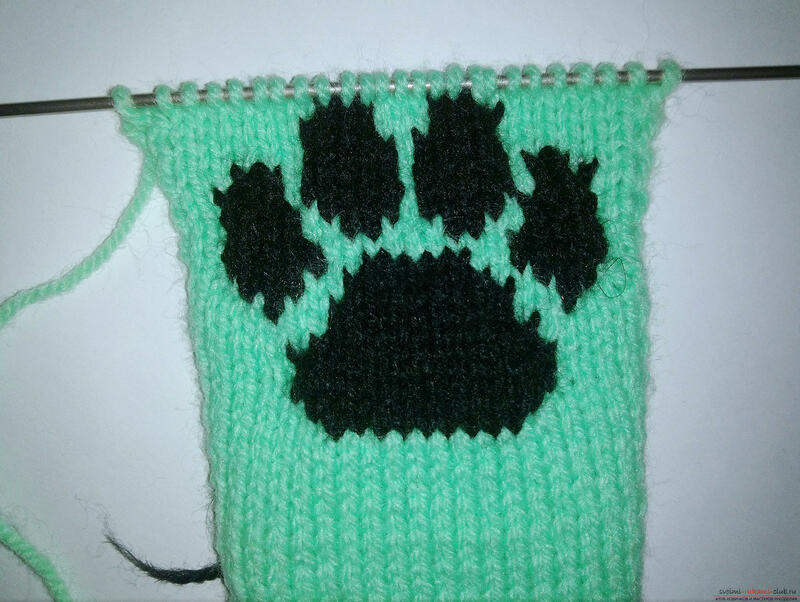 We knit three green loops, four black, two green, two black, three green, two black, two green, four black and three green. 13 picture series: We knit three green loops, four black, one green, four black, one green, four black, one green, four black and three green. 14 a series of drawings: We knit three green loops, three black, one green, five black, one green, five black, one green, three black and three green. 15 series of figures: We knit four green loops, two black, one green, five black, one green, five black, one green, two black and four green. 16 series of figures: We knit seven green loops, five black, one green, five black, seven green. 17 series of figures: We knit this series exactly as the 16th. 18 series of figures: We knit seven green loops, four black, three green, four black, seven green. 19 series of figures: We knit eight green loops, three black, three green, three black, eight green loops. Our drawing is finished. 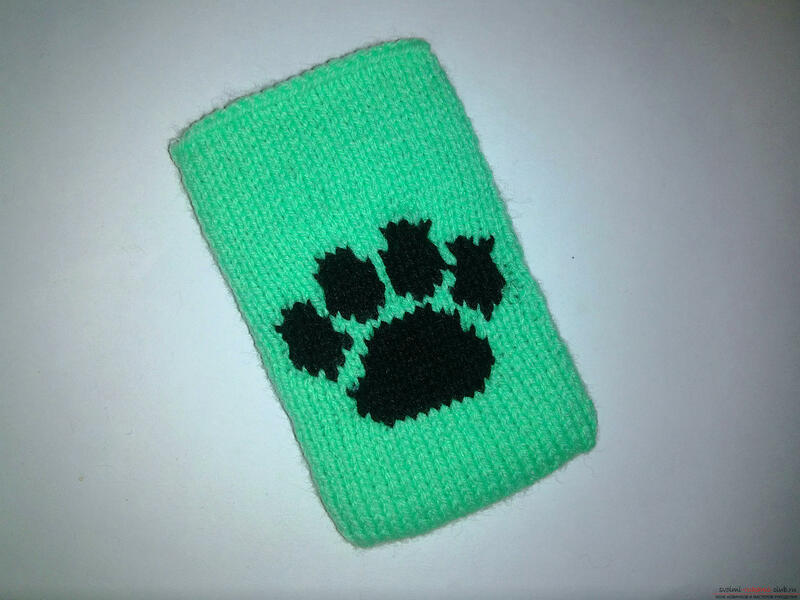 Then we only knit green yarn. We knit another third. That is, we need to link as many ryadochkov, so that the cover closes the phone on both sides. Now just sew on the sides with a needle. This is the case for the phone! 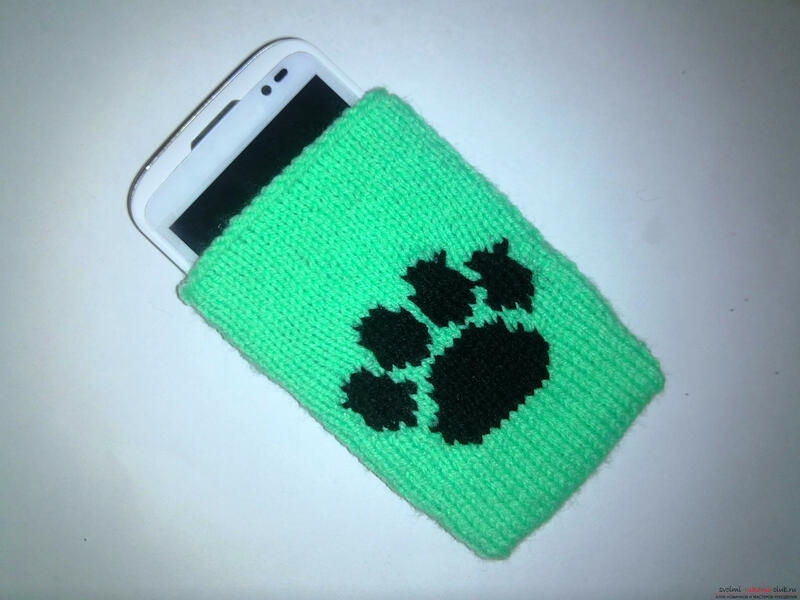 This master class knitting for beginners will teach how to crochet the phone case Master class with photo and description will teach how to tie your hands with New Year bags for gifts A master class on crochet will teach you how to tie your mittens with your own hands. This master class toys will teach you how to tie a zebra crochet This detailed master class contains a crochet lesson and will teach you how to bind berries by yourself. New Year costumes with your own hands, how to make a snowman costume yourself, options and examples of making individual costume details.